Mohd Ali showing the construction of the complex in Malacca during a visit recently. MALACCA: Construction of the state’s recently revived Customs Immigration and Quarantine (CIQ) complex is expected to be fully completed by March next year. Chief Minister Datuk Seri Mohd Ali Rustam said the government had strived hard to ensure the project was restored after the initial construction hit a snag due to technical hitches on the part of its previous contractor. “We have commissioned a second contractor and up to now 38% of the project is completed and if all goes well, we could anticipate the RM73mil complex to be operational by mid-2012,” he said at a site tour recently. Once completed, Mohd Ali added the complex could accommodate 15,000 visitors arriving from neighbouring countries on a monthly basis. “This will certainly be a boost for Malacca in terms of the tourists arrivals,” he said. The CIQ will complement the Batu Berendam International airport as a major gateway to the state and also to expedite the entry process for foreign tourists. 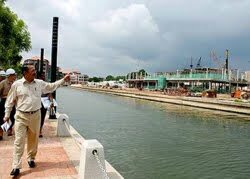 Mohd Ali said once the CIQ was completed, the state could also attract tourist boats from Singapore and Batam to enter the local waterway. He added that frequency of the current ferry services from Bengkalis and Dumai in Indonesia could also be doubled with the new facility. The increase, could turn the Malacca port as an optional hub for ferry services from neighbouring countries. On another matter, Mohd Ali said the government hoped to introduce a tram car to ferry city folks to several selected destinations. He said the tram service would help alleviate traffic congestions at the city-center while the monorail service was also expected to resume soon and would serve several populated areas here.